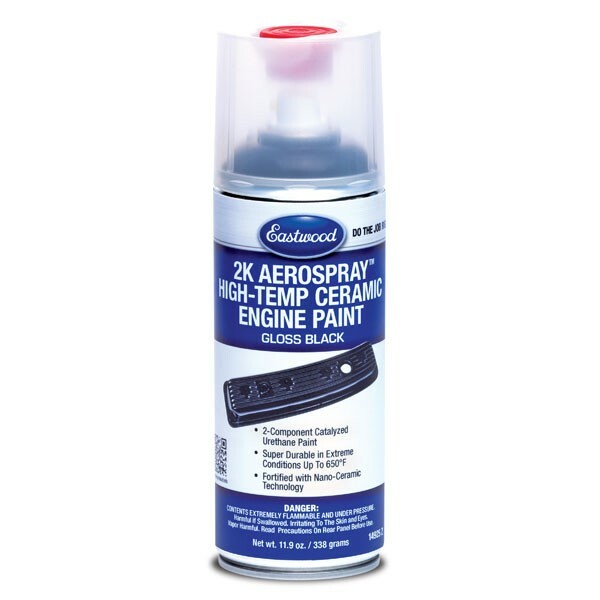 Eastwood's 2K Aerospray High Temp Engine Paints allow you to paint with the durability and precision of a two component coating without the paint gun. Before activating, shake aerosol vigorously for 1 min. Take red button from cap. Rotate aerosol 180 degrees and attach button to pin on aerosol bottom. Place aerosol on firm ground upside down. Press red button with the ball of your hand until stop is reached.After activating, shake aerosol again vigorously for 2 min. Pot life 48 to 72 hours at 68 degreesF. Always wear eye, skin and respiratory protection when using this product. Product contains isocyanates, wear NIOSH approved breathing equipment.Always use in a well ventilated area away from open flame. Consult MSDS for specific safety warnings. 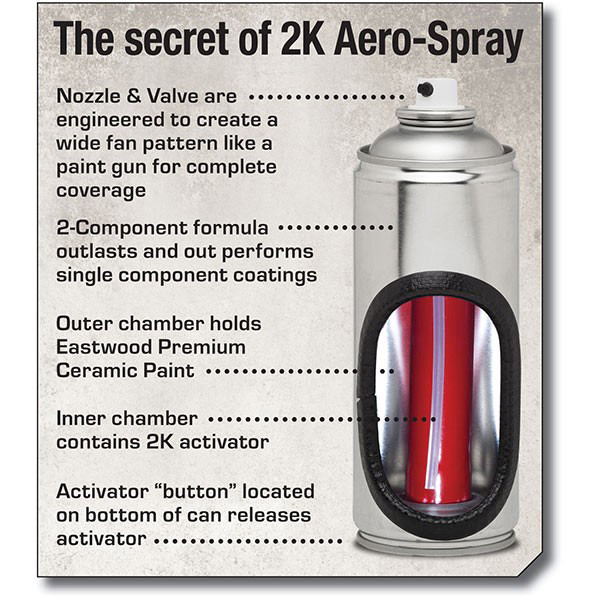 2K Aero-Spray - Aerosol with Activator Explained - Spray Gun in a Can! Innovative nozzle technology sprays with a wide spray pattern giving you excellent coverage and more control than conventional aerosols. Formulated with Eastwood's proprietary Nano Ceramic Technology to provide you a long lasting, beautiful and durable coating. Eastwood uses innovative features to allow professional results out of an aerosol.. 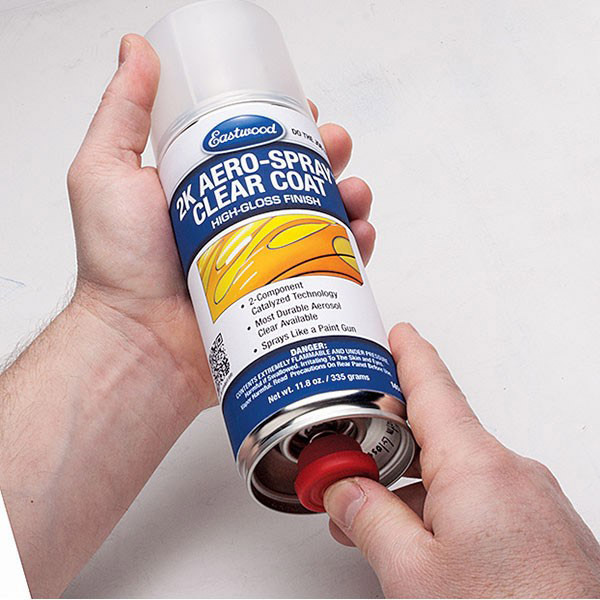 The unique 2 chamber spray can provides the perfect ratio with no mixing, every time. The advanced nozzle and valve achieve a paint gun like wide fan pattern for better coverage. The nano ceramic formula with silicone alkyds, available nowhere else, creates a tough, long-lasting finish that will look great for years to come. 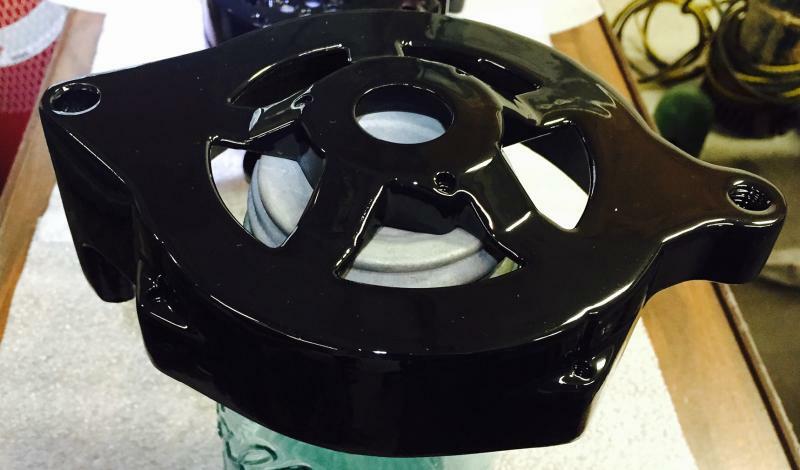 Use urethane primer gray under all other 2K AeroSpray's after proper prep for a better quality finish. These high temp paints are the highest rated in the industry and withstand up to 650�. NOT FOR USE ON EXHAUST MANIFOLDS OR HEADERS. I purchased this a couple months ago while I was in Pennsylvania in preparation for the completion of the 302 for my 69 mustang. I wanted something that was close to the original but would last longer than the junk you get at autozone. This stuff lays down amazing and covers great. When if bought it I was told to get the primer and it would take a couple cans to do the whole engine. I paired the heads today and didn't even use half a can I believe I could have done it all with only 1 can considering I'm not painting the intake or timing cover. But I will be able to lay down several nice coats that will make this engine look like one from a show car. This paint lays down flat, dries fast and covers great. I will definitely use this again on my next engine. 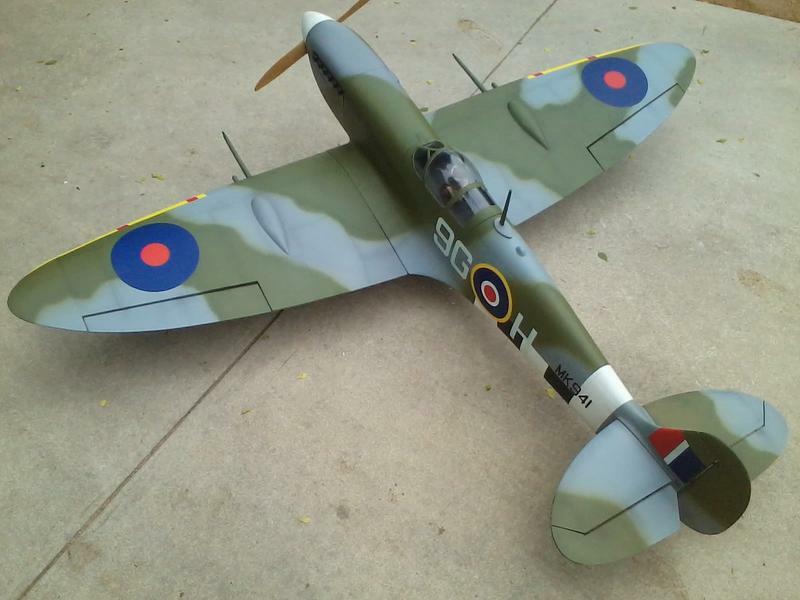 I used this paint to repaint the 351W engine block I am rebuilding. While I was at it I also painted my alternator covers, timing chain cover, and thermostat housing. The paint sprayed on even and heavy. The gloss was perfect, it cured quickly and very hard. Hands down it was the best engine paint I have every used over the last 25 years of motorcycle and car rebuilding. I basically got pro results out of a can! I used this as a fuel proof coat on my gas engine giant scale radio control planes, they get raw fuel on them and the two stroke engine sprays oil all over from the exhaust. This product holds up outstanding to this abuse. I love the convenience of a two part paint in a spray can! Paying a little more for the convenience is definitely worth it, I hate messing around with spray guns and mixing paints. Two cans is plenty to cover one giant scale 90" wingspan plane. Sprayed nicely. Used 2 cans for engine. Put paint over an Epoxy Basecoat and had good gloss and color holdout. Bought the 2k ceramic engine paint gloss black to paint the frame and racks on my trex500fa. The frame is powered coat and the ceramic paint blends right in that you cannot tell that it has been touched up. 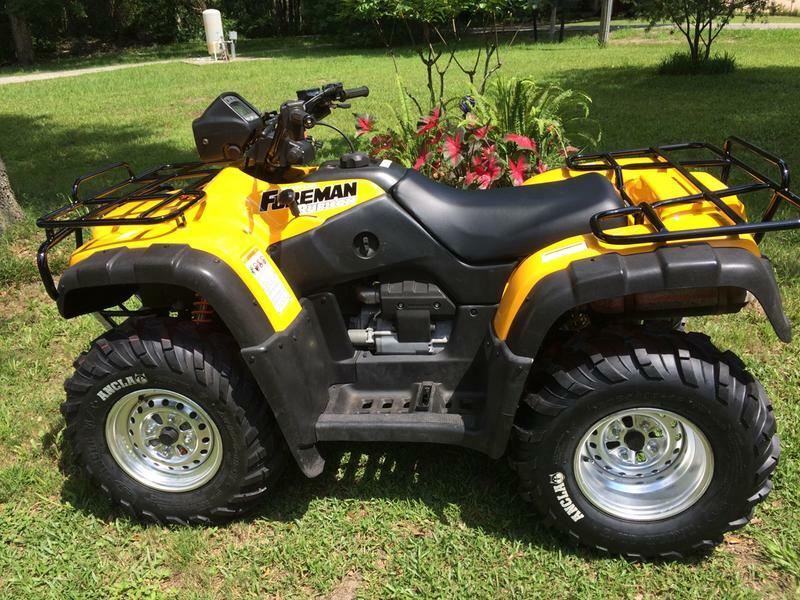 Painted the racks, front and rear ended and other parts on the atv. 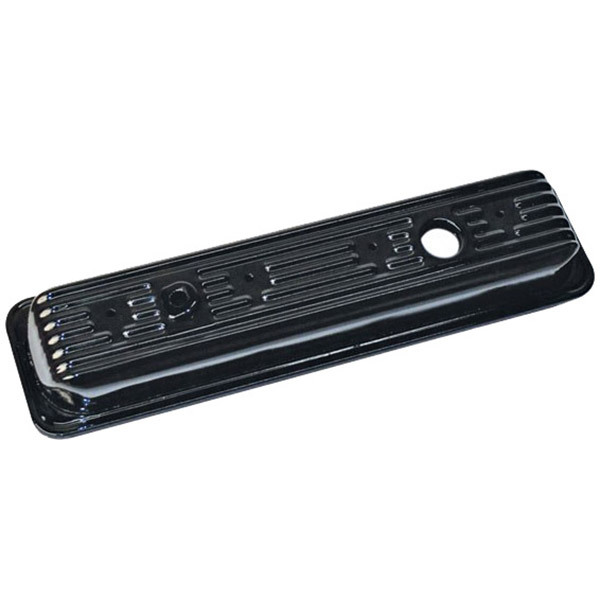 Very nice product, can handle within a hour and you will be as pleased as I am. I used it on a set of new rally rims for my 49 Dodge truck. I didn't like the color choices on the Eastwood wheel paints and wanted something fairly tough so I went with this instead. Really happy with the outcome and this paint is pretty forgiving as I was painting in less than ideal conditions. Finished it with some 2K clear. They look great. Works very well with a nice finish. Surface prep is important and the primer is recommended. Coverage is a bit less than advertised and the can must be held upright to get all of the paint out. Wear a mask, this stuff is potent! 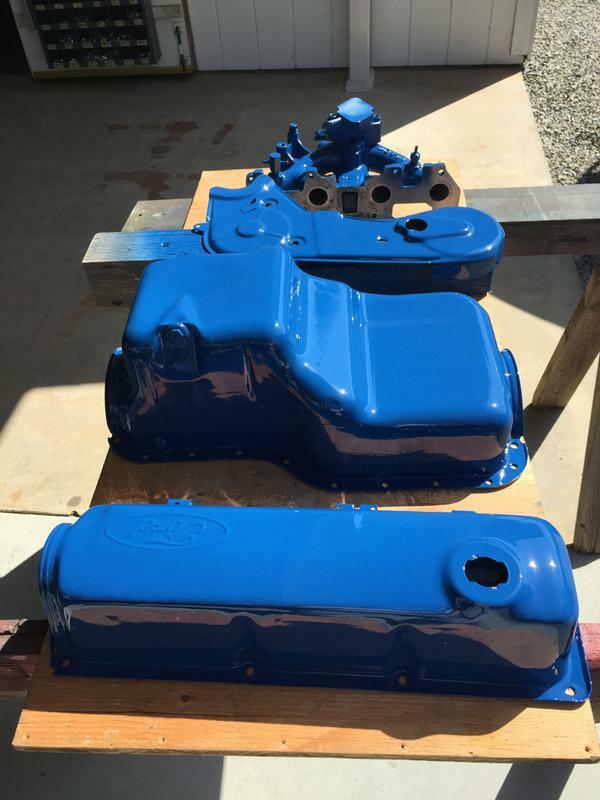 In rebuilding a Rover V8 engine, I used four kinds of Eastwood paint. I used this product for all of the parts, e.g., SU Carbs, that I wanted to be "bright." It went on nicely and provides a very elegant finish. I used this product on my engine fluid damper. It was easy to use coved vary well looked like it was sprayed with an professional spray gun. 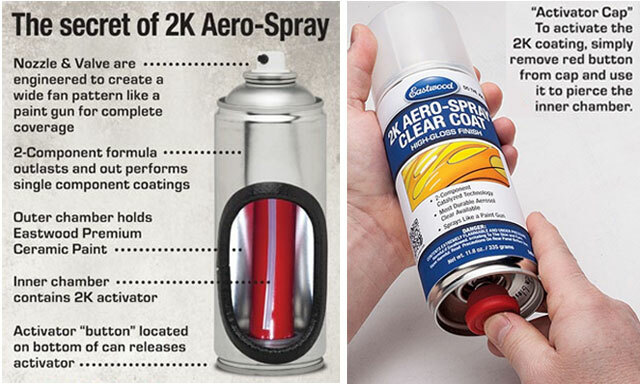 I bought this 2k spray to use in a non-automotive application that required a high temp paint. This stuff sprayed out great and the coverage from one can was awesome. I bought the gloss red engine paint along with a can of the gray primer. 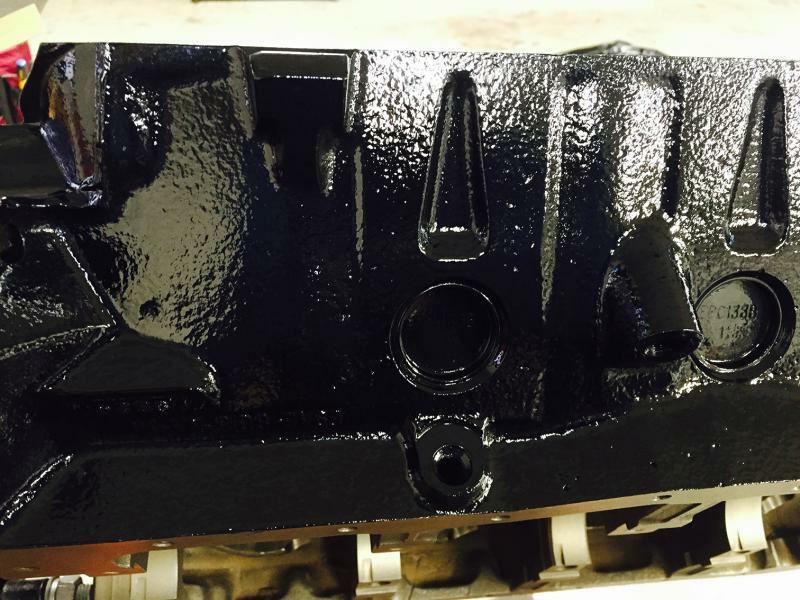 After painting an LS engine block and valley cover I used the gloss red for final coat. It covered very well so I was wondering if I needed the primer first. The red covered the block and valley cover with more than two coats. Unlike the primer, which I had some left over, I did not with the red but it was more than enough for what I was painting. was Real impressed with this (never used 2K in a Rattle Can) dries Quick covered Great! Already told my ford friends ! covers good, dries fast and has a nice smooth shine. 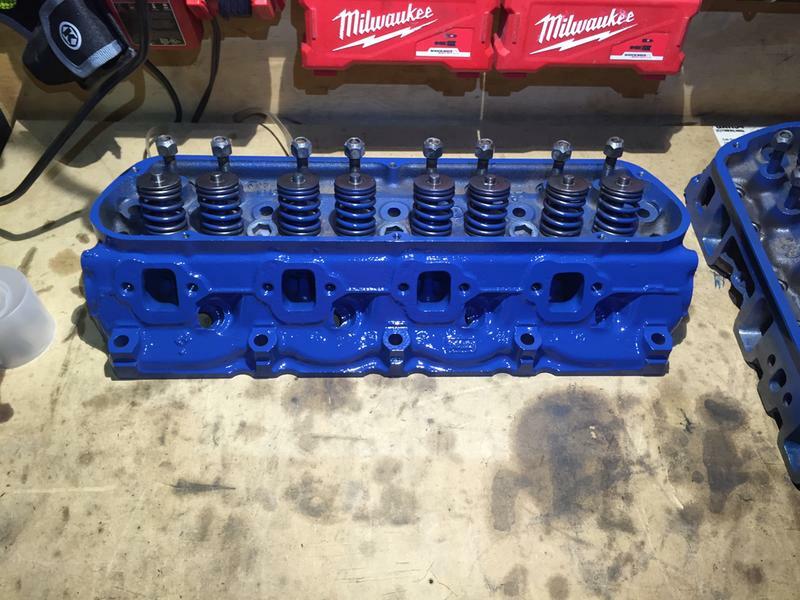 I purchased this to clear the intake and block of my new 454HO motor from Chevy. You need to wear a respirator because this stuff flashes off solvent like crazy. The shine is incredible. I also cleared an oil pan a battery tray and some other items. Where was this paint when I was a kid? Kind of pricy but for small jobs it is great and there is no cleanup! 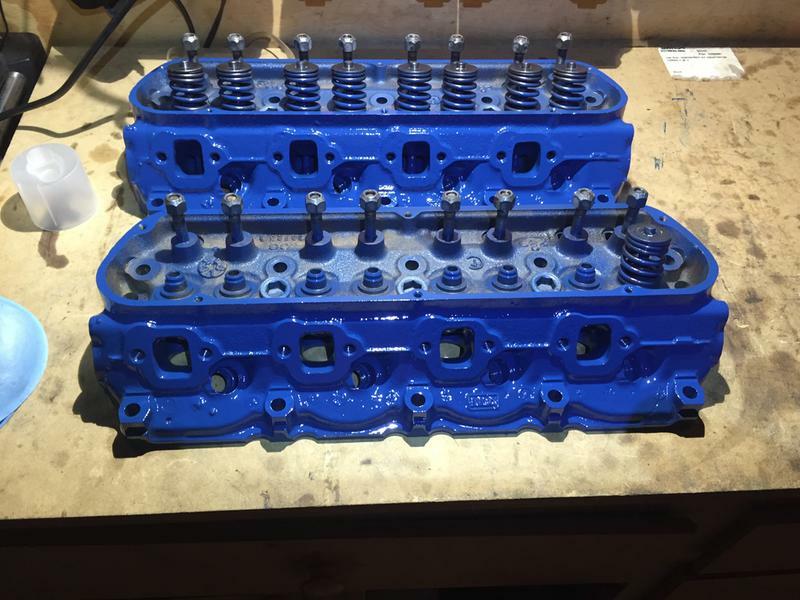 I bought the engine primer and gloss red to paint a LS block and valley cover. I was concerned, after reading some ratings, if one can would be enough. It covered the block and valley cover with plenty to spare. I checked the can the next day and it still sprayed ok and that was about 24 hrs. Used blue ceramic engine paint on my plastic spike lug nut covers. Excellent coverage, awesome finish which matches ford logo perfectly. Very impressed first time using. Wish there were more choices such as white, limited on colors though. This is the second can of Gloss Clear I have purchased. I use it on my vintage Motorcycle restorations. Wonderful stuff, dries fast, and leaves an very fine finish. Will continue using this product on upcoming projects. Expensive stuff, but it's the closest thing you can get to a professional paint job. I painted my riding mower with 1 1/2 cans. I also painted my 350 small block with the 2k aerospray gloss red. Awesome results! Painted Harley live on gravel no chips! recommend! could not believe how perfect the finish turned out!!! Go's on smooth, dries fast, looks real nice. Thanks for a good product Eastwood.